Is it a shoe? Is it a butter dish? Hard to tell. 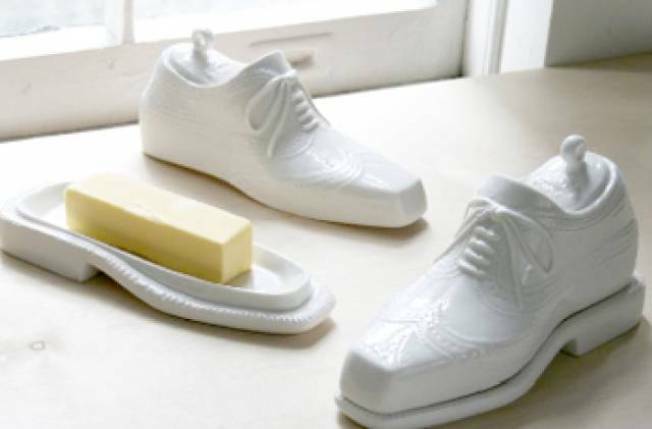 DAPPER DINERWARE: A glazed porcelain brogue butter dish by Jonathan Adler becomes a kooky addition to the dinner table. It’s crafted from high-fire porcelain and finished with a gloss-white glaze. $64. Available at Jonathan Adler. 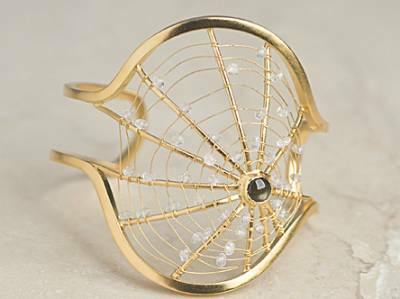 WEB OF STYLE: Weave a web of jealousy with the Spider Web Cuff in Gold by Julia Failey. When others see you sporting this bracelet with White Topaz woven around a Black Star Sapphire, they’ll want it too, yo. Get it at Julia Failey. PUT YOUR FEET UP: The sought-after Missoni fabric is draping furniture now, too. Oh joyeous day. In this case, it's a round ottoman with signature Missoni print and embossed leather strap. Available at Stitch Chicago.